Identification: This is an elongate, yellow to white species marked with irregular violet-brown bands near the branchia and rhinophores. 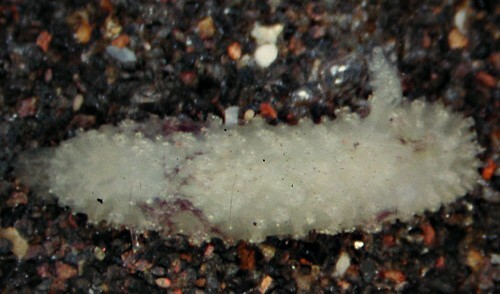 The papillae are short and blunt while the rhinophores have only five or six lamellae (in contrast to Atagema echinata). Natural history: Atagema sp. #18 is known from five animals. Two were found at an exposed rocky site at < 5 m (< 16 ft). Another was found in a Halimeda kanaloana bed at between 8 and 20 m (26 and 66 ft). Distribution: Maui and Oahu: possibly also known from Japan and Papua New Guinea. Taxonomic notes: The papillae in these animals are similar to those of Atagema intecta suggesting that they might ultimately turn out to be very small juveniles of that species. Or, they could be related to Atagema sp. 5 in Gosliner, et. al. (2015). Photo: CP: 4 mm: Maalaea Bay, Maui; May 3, 1996.